Thank you to all our students (and staff) who donated gifts and money and created boxes for this year's Operation Christmas Child appeal. This year we had an amazing 118 boxes and raised £120. 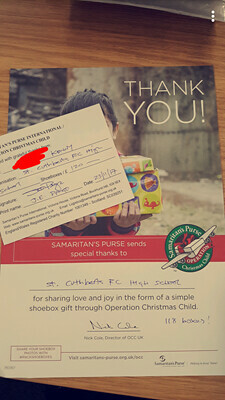 Each year St Cuthbert's takes part in Operation Christmas Child. This is a chance for us as a community to give the gift of joy and happiness this Christmas to children around the world that our less fortunate than ourselves. Over the past few years St Cuthbert's has sent hundreds and hundreds of boxes to places in Eastern Europe and as far afield as Africa. This year, why don't you get involved and put together a box, and become the Good Samaritan!